Beautiful Bittle constructed custom home at the end of a private cul-de-sac street in Rumbling Bald Resort. Breathtaking 180-degree views of Lake Lure’s North channel. 2-bay boathouse w 1 lift & sundeck w an enclosed full service kitchen/bar. This 4000+ sf home boasts an open floor plan in the main level great room w floor to ceiling stone fireplace; gourmet kitchen w pantry; half bath, and an en suite master bedroom w private balcony. 2nd floor loft has 1 BR & full bath. The lower level features include family room, gas fireplace, wet bar, 600 bottle wine cellar, 2 BR's, 2 full baths. Enjoy the resort life w 2 world class mountain golf courses; 2 outdoor pools, one with a lazy river; an indoor pool with hot tub, sauna, and steam room; full wellness center with spa services and fitness center; beach; marina; mini golf; bars and restaurants. 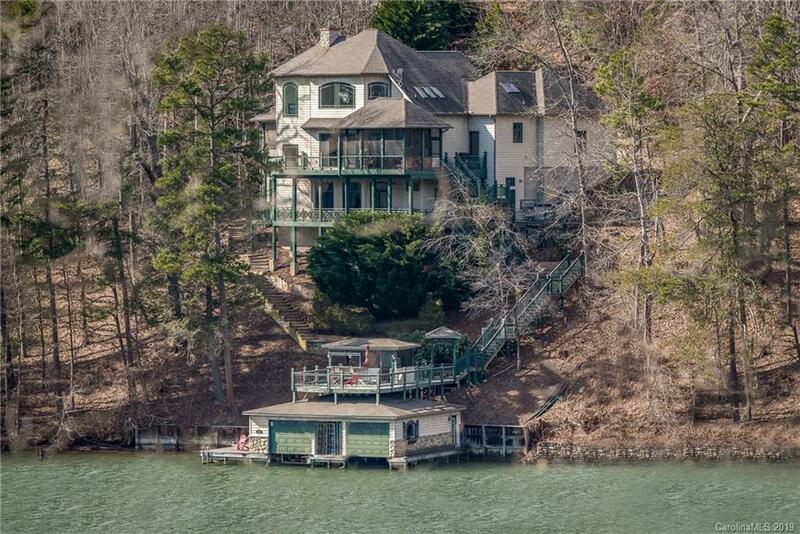 This home offers the complete lake experience, a high producing rental history, and simply too many features to list! Adjacent lot also available.